Bear Model's Megaro-Goji was originally released in 2003 and made a limited appearance at that year's San Diego Comic-Con in conjunction with Super7. 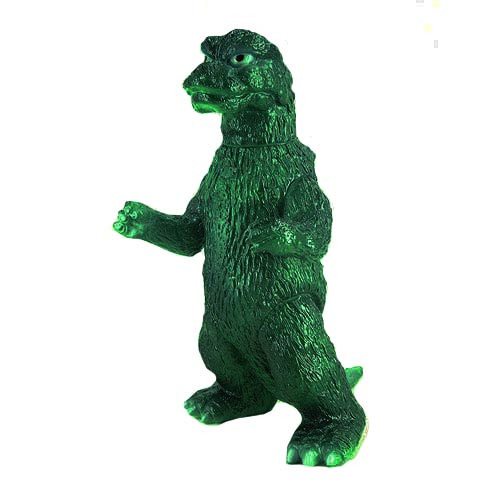 Styled after Godzilla's appearance in Godzilla vs. Mechagodzilla, this Godzilla Vinyl Wars Bear Model Godzilla 1974 Sofubi Vinyl Figure stands about 9-inches tall and features a more accurate green appearance. It's a limited edition if only 200 pieces! From Bear Model and Medicom Toy, Godzilla: Vinyl Wars is a collaboration between Japan's classic Sofubi manufacturers and cutting-edge toy maker Medicom Toy. Each release in GVW is a reproduction of a classic Toho Sofubi from the 1960s through today, released legitimately for Western collectors for the first time ever. These hand-crafted, hand-painted figures inspired the designer toy movement will hold a place of high honor in your collection. lla vs. Mechagodzilla, the Godzilla Vinyl Wars Godzilla stands app. 9' tall, and bears a new, truer green appearance. This figure is limited to an edition size not to exceed 200 pieces! For ages 15 years of age and older.